Is the Planner a Tastemaker? “The planner is not a tastemaker,” asserted Sara Myerson, Boston’s Director of Planning, in a roundtable discussion at the GSD’s Big City Planners program this past October 2018. In one concise and precise statement, Myerson diplomatically, yet vehemently rebutted the planner’s interference with the sensitive question of what the city ‘should’ physically look like. In an interview in 2012, Amanda Burden, then Director of New York City’s Department of City Planning, was asked about the inclusion of the syntagm ‘superior design’ in its East Midtown Study, (wording discretely removed since the interview). She denied the use of the term ‘design’ in the Study and retorted: “It really can’t be subjective according to somebody’s taste or whim. This is too important to the city’s future, too important to the skyline.” In the context, developments deemed of a ‘superior design’ would have been rewarded with an FAR bonus. Implicit in Burden’s and Myerson’s blunt statements are a total renunciation of any possible association with the values and beliefs of the City Beautiful movement that transformed America’s urban skylines and physical plans over the turn of the nineteenth century. In the name of ‘urban beautification,’ architect-planners, organized in private associations, proposed and implemented visions for the city which bore distinctively European-inspired architectural styles, notably of the Italian Renaissance and Greco-Roman Antiquity, in size, form and ornament for modern America’s civic centers. While it is understandable why a disassociation with the City Beautiful movement and its undemocratic planning and stylistic preference is necessary, it is also difficult for zoning codes and resolutions to escape prescribing what the physical environment they are supposed to plan should look like. The glossary of planning terms used by New York City’s Department of City Planning includes definitions that govern super-specific aspects of the city, including street wall, street line, building height, parapet, sky exposure plane, building bulk, building envelope. In this sense, while the glossary of terms presents a seemingly ‘neutral’, ‘objective’ and ‘technical’ position vis-à-vis urban design, many assumptions about what the city should look-like are implicit and by no means absolute. For example, New York City’s planning concept of the street wall as a continuous surface aligned with avenues and streets has produced an urban environment with accentuated deep perspectives. But who took ownership of this particular physical vision of the city? What if the assumption were of a setback in the street wall, not every 200- or 600-feet respectively (the dimensions of a standard Manhattan block), but, say, every 25-feet (the dimension of a standard Manhattan lot)? What if the deep perspectives of street walls were replaced by crenelated surfaces of street curtains? Would they constitute an equally valid assumption? Another example is that of building height restrictions, often in the name of “character preservation,” an undefined term in the planning department’s glossary. In the Department of City Planning’s 2010 rezoning of Manhattan’s West and East Villages, building heights of 8- and 12-stories respectively were put in place. Burden stated that the rezoning would “ensure that the historic building stock along these streets is protected and that the residential community is no longer threatened by out-of- character commercial development.” However, building height is not a universal feature of neighborhood character and oftentimes parameters such as building materiality, the way a building meets the ground or its architectural style may be more defining of character. “[…] the Commission believes that the applicant has not made a convincing argument that the design of the tower’s top, with the uppermost 200 feet of the building, merits being in the zone of the Empire State Building’s iconic spire, making the building the second tallest building in New York City. 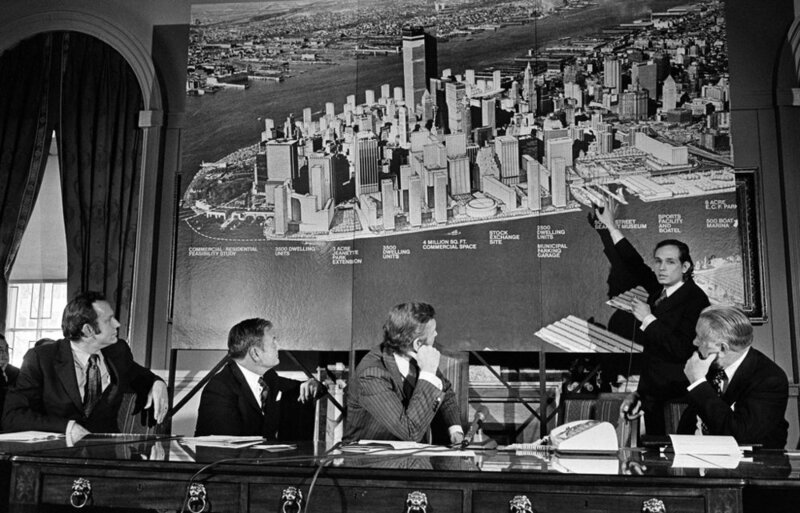 This evaluation was followed by a building height limit that reduced Nouvel’s tower by 200 feet, a direct design restriction by the City’s planning bodies that would control the form of New York City’s skyline. In this context, planning is inherently visionary, but without claiming authorship of this vision. Perhaps, authorship is impossible in the greater administration of urban governance in the US, which fashions planners into public functionaries. However, given the profession’s nature to prescribe formal aspects of cities, planners are, even without necessarily wanting to be, tastemakers. In this sense, planners must take a position. They must either take ownership of their tastemaking powers or concede to ‘professional’ design bodies. The middle-ground planners currently occupy, forced to regulate physical environments, yet hesitant to admit to it, reflects the inherent hypocrisy of the profession while doing it disservice altogether. Therefore, I end with a crucial question facing the profession today: in accepting their inherent tastemaking powers, should planning departments be democratized to more publicly and wilfully plan for ‘superior design’ in cities? Quoted in: Jacobs, Karrie. “Uttering the D-Word.” Metropolismag.com. (10.01.2012). https://www.metropolismag.com/uncategorized/uttering-the-d-word/ (accessed November 22, 2018). New York City Department of City Planning. “Glossary of Planning Terms.” Nyc.gov/site/planning. https://www1.nyc.gov/site/planning/zoning/glossary.page (accessed November 22, 2018). Quoted in: Hedlund, Patrick. “City Planning Approves Building Height Limits in the East and West Villages.” Dnainfo.com. (09.29.2010). https://www.dnainfo.com/new-york/20100929/manhattan/city-planning-approves-building-height-limits-east-west-villages/ (accessed November 22, 2018). Quoted in: Brown, Eliot. “Amanda Burden to Chop 200 Feet Off Nouvel’s MoMA Tower.” observer.com. (09.08.2009). https://observer.com/2009/09/amanda-burden-to-chop-200-feet-off-nouvels-moma-tower/ (accessed November 22, 2018).